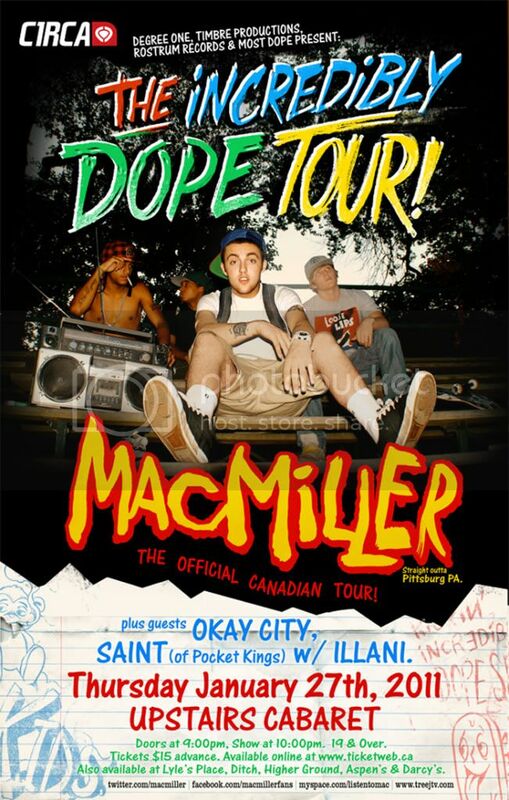 The Incredibly Dope Tour feat. SAINT (of Pocket Kings) w/ ILLANI. DJ JETTS and DJ ARSON. UPSTAIRS CABARET - 15 Bastion Square, Victoria, BC. Doors at 9:00pm, Show at 10:00pm. 19 & Over. Also available locally at Complex, Lyle’s Place, Ditch, Higher Ground, Aspen’s & Darcy’s. "Now comes the 17-year-old Mac Miller who’s been spending the last hot minute carving out his own niche and establishing himself as one of PA’s premier prospects on the mic.” – XXLMAG.com. — VOTED AS THE Pittsburgh Hip Hop Awards’ 2010 21 and under ARTIST OF THE YEAR.